When adding Buddies the Buddy will appear in the Buddy List and then fade in and out to highlight this action. Sometimes they will disappear completely, particularly if you are not showing Off-Line Buddies. There can be several reasons for this and several checks need to be made to iChat and it's settings and possibly your Buddies settings and sometime a little deeper. Check the List to see if the Buddy is there. Your Security/Privacy Setting may need sorting. They may be using a client or Version that can be set to be Invisible. Select the Address Card in the drop down or tab depending on version. First of all check Spelling of the screen name. I can use about three fingers on both hnads to type but often enter things with my left hand before they should which transposes letters such as ralphjohsnr instread of ralphjohnsr. I often find that I have hit two keys at once adding extra letters as well. The second issue is a variant on this in that iChat adds the @mac.com suffix (or the @me.com one) without you having to type them when choosing the Account/Screen Name type. It is very easy to forget to choose the type at the relevant stage. In the first Picture the @mac.com is out to the right of the Account Name field. In Leopard the Suffix involved is in the field already but greyed out with the cursor in font of this to try and visually remind you. As ralphjohnsr, ralphjohnsr@mac.com and ralphjohnsr@me.com are all valid AIM IDs iChat and the AIM server where they are kept will recognise them as such and add them to the Buddy list. Obviously only one is an actual Buddy. In earlier versions you can highlight the Screen Name in the iChat Address Card and delete the Suffix from the Screen Name. If you are not sure. 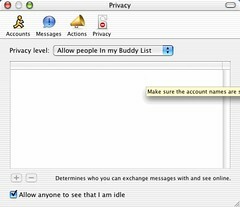 delete the Buddy in iChat, Edit the Address Book card for that contact (if they have an Address Book entry) and Re-add the Buddy. In iChat 2 the iChat menu > Preferences have a separate Privacy icon and pane. you need to Check that your Buddy is Allowed and Not Blocked. Apart from this it is a question of checking and editing the various lists to get the correct Buddies to Show as On-Line. People or Buddies added to the Buddy list will display as On or Off line depending on the things discussed in this section. If you remove someone from your Buddy list because you don't want to have contact with them this will allow the to see you as On-line and contact you. Having them in the Buddy List but blocked will make you appear Off-Line to them and prevent contact. The Allow Buddy List Only option and a removed Buddy will achieve the same thing. That is to say that if your Buddy has you Blocked or has Allow Buddy List only set and has not added you to their Buddy List or not added you to a Specific Peope list then they will appear Off-Line to you - the reverse of the Note Box above. In this case you may have to check with your Buddy about their Settings as well. Check Spelling of Buddies Screen Name and which Account type it was added as. Check if they are On or Off-Line or that the iChat settings - at both ends - allow you to see each other as On-line. 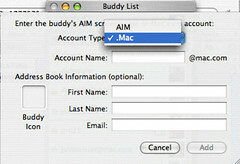 First of all in iChat 3 and Earlier it is possible that you actually get an Error Message when adding a Buddy to an AIM Buddy list. "Could not add 'screenname' to your buddy list. (Feedbag error 10) or (... 17 or 14)"
Feedbag Error 17 is a message from AIM that your Buddy List is full. Make sure that your Buddies do not appear in more than one group as they get counted twice (or more) this way. The limit was 200 and the Error 17 is less common now. add the second screen name after the first one with a comma in between in the Address Book (ralphjohnr,rlph820) in the AIM entry points or add an extra AIM field to the Address Book card to hold the second name. Alternatively the names can be added in this way to the Buddy Info Accounts/Address Card drop down or tab when you use the Command/Apple//⌘ key and "i" together (Get Info) when a Buddy is highlighted in the Buddy list. In Leopard the Error message reporting has been taken out and all you see is the Added Buddy flash several times and not appear even in the Off-Line list. Presume that you have Feedbag Error 10 and check the Address Book entry for the Buddy. Feedbag Error 14 is to do with adding ICQ account names. Use the same approach as Feedbag Error 10. For clarity there is this from Sabrina Leistner from Germany. The person who is supposed to be added to a buddy list has to check whether he/she has allowed "all users to add me to their Contact List and see my Online / Offline status"
It has been found that some modems such as Zyxels and some that specify Port Forwarding with Protocols - do not like this double use of Port 5190. For these it is best that you go to iChat Menu > Preferences > Accounts > Server settings and change the Login port to 443 to separate the Login from the UDP feedback (and File Sending) port. This may well help with adding some Buddies. Of course the same port and particularly if required the Protocol neds to be allowed through any Routing device. See page 4 for more on this. Realistcally this is where you get to if you have checked Spelling, how you added the Screen Name, if they are On-line and are not Blocked and the port is allowed in your Modem or router. There is no real way to check the quality of your Login. It can only be infered that something is not quite right and prceed with things that will sort this. Can also work for some problems with Video chats. What both methods force the OS to do is re-establish the Network Settings which can clear some problems with the AIM login in this case. As with most things internet the connection can be suddenly dropped. With a web browser or Mail you just hit the refresh or Get Mail Button to re-establish the connection. As iChat is an Always On connection (Web Browsing and Mail are intermittent) a sudden drop by the AIM servers can cause problems as their Info on when and how you are logged in may differ from what is stored in com.apple.ichat.AIM.plist about the process from your end. You can try Logging out of AIM in iChat if it shows you as Logged in and you cna get a Response. More often than not it will try several times and pop up an AIM issued message saying you have tried too often and to try later. At this point the only realistic thing to do is to delete the com.appl.ichat.AIM.plist and restart iChat to recreate the .plist involved. As mentioned the .plists are in your Little House icon then the Library Folder within that and the Preferences folder inside the Library one. You can only get there by clicking through the folders involved as SPotlight and Find do not look in here. Drag the com.apple.ichat.AIM.plist item to the Trash and restart iChat to recreate it. This should sort any Login issues and should help in adding some Buddies. In Leopard the issue can go deeper for some reason. It casues the AIM valid Accounts you have not to show in the Window menu nor in the Accounst submenu of the iChat menu AND the Link to Preferences also appears greyed out. As this FAQ/USers Tip at Apple says it can be linked to sync problems with the AIM Servers when they clear out old Screen Names. If you have this level of issue use the FAQ/Users Tip. Force a Network reboot possibly with a restart of the computer.